It’s about the get a lot easier to do your workout outside most days of the week. With warmer temperatures in sight, lacing up the tennis shoes and going for a run is an attractive option. Run your hearts out, sweat-lifers, but this is your gentle reminder to cross-train during these warmer months, not only to keep you injury-free, but also to help make you a stronger runner. If the sun shining and the birds singing is just too much for you, and you can’t handle being inside for even a minute, there’s good news for you: a bodyweight workout can be done almost anywhere – in your living room, a hotel room or your favorite park. This total body bodyweight workout will help you get a workout in no matter where you are. 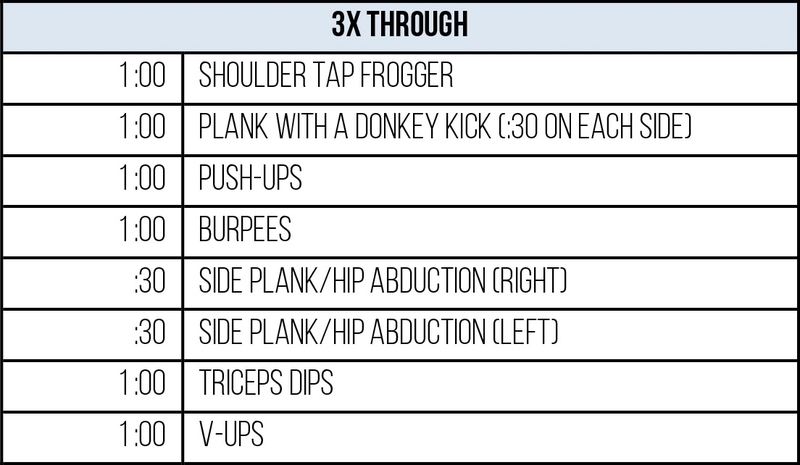 You’ll go through this workout three total times, doing seven total exercises. You can take a minute off between sets and :15 seconds off between exercises. If you want a timer to keep you moving through the workout, I like the Seconds app, which allows you to set custom timers for whatever fits your workout fancy. Need a playlist for a little extra motivation? You can use my workout playlist for the week on Spotify. In this workout, I’m wearing a look by Nike Women (Thanks, Nike!). I’ve got on the Nike Free 1.0 Cross Bionic shoe, the Nike Legendary Tight, the Nike Pro Indy Freeze Frame sports bra and the Nike Elastika 2.0 top.